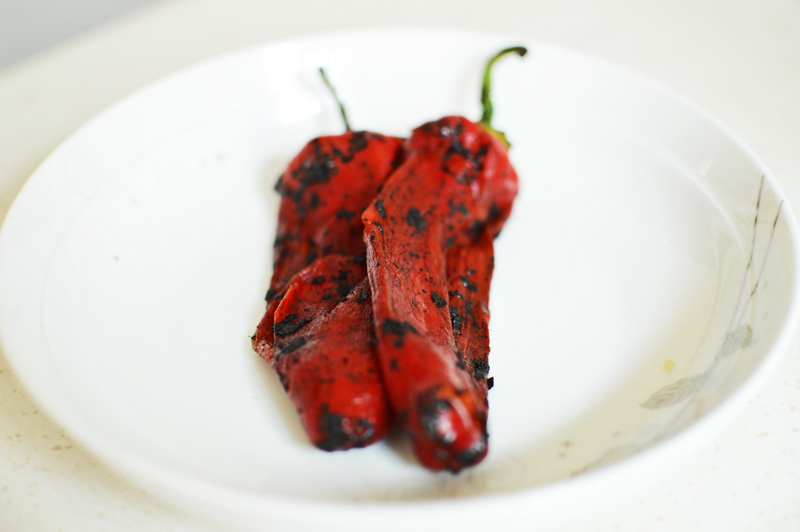 What can I say about roasted peppers, except that they are divine. They’re the equivalent of a food poetry. They bring to life anything they are added in. Their subtlety of flavour livens up even something as meagre as a stale slice of bread. It’s like the rhyming word which makes a verse all the more interesting. The slightly smoky, charred flavour is harmonious with almost everything.You can add this to a sandwich, throw it in a bowl of pasta, puree into a soup or just drizzle it with olive oil and serve as a side dish. This is guaranteed to brighten your table, your mood and your food. Also it’s really easy, and you could do this in a matter of minutes. You don’t need a whole list of ingredients, except perhaps some peppers. You can roast any pepper of your choice, I’m doing red peppers, but you can go ahead with whatever suits your preference and your colour of the day. yellow, orange, green.. whatever coloured pepper is available. I’m a stove top girl, when it comes to roasting peppers. You could just as easily pop this in a hot oven, but for me, this technique is better suited since it’s charred and burnt evenly on all sides. Place the pepper on stove top like so. 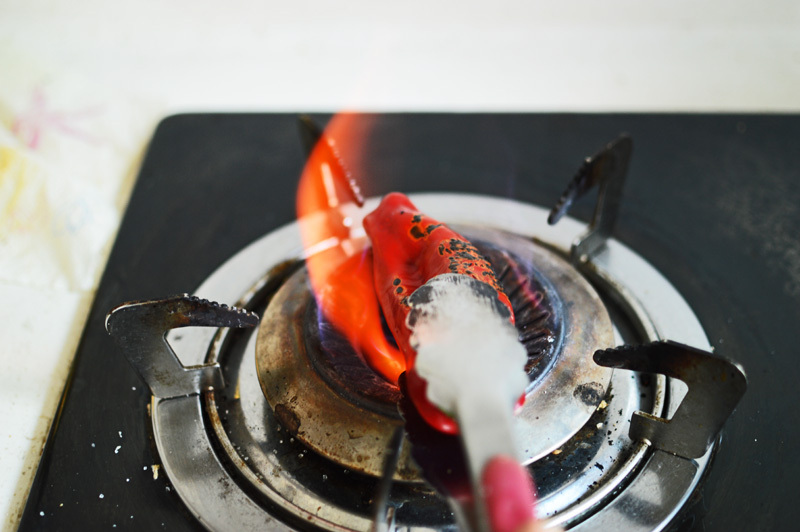 The flame should be high enough to not only roast it but blacken it. Time for tong action!! You really do need a tong for this. keep rotating on all sides until it’s seriously blackened. Leave no side even a bit coloured, including the tip. You really need to blacken up these babies. 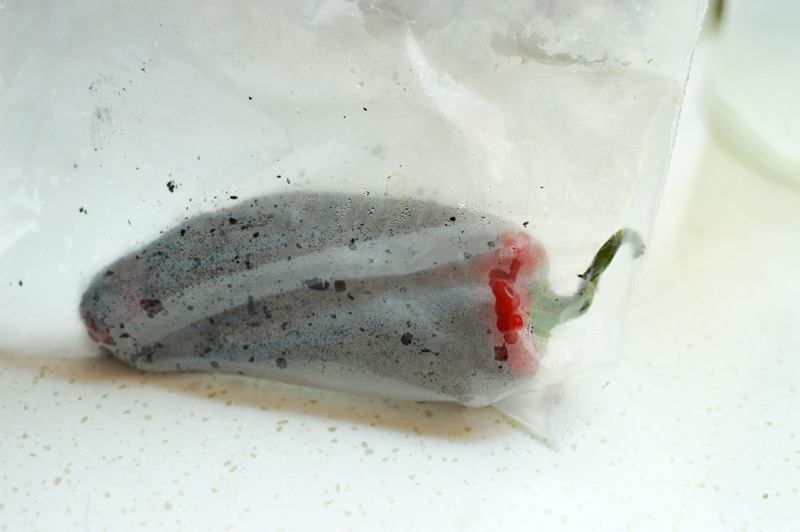 Once it’s coal-black, lose no time and put the peppers in a ziplock bag and seal it. 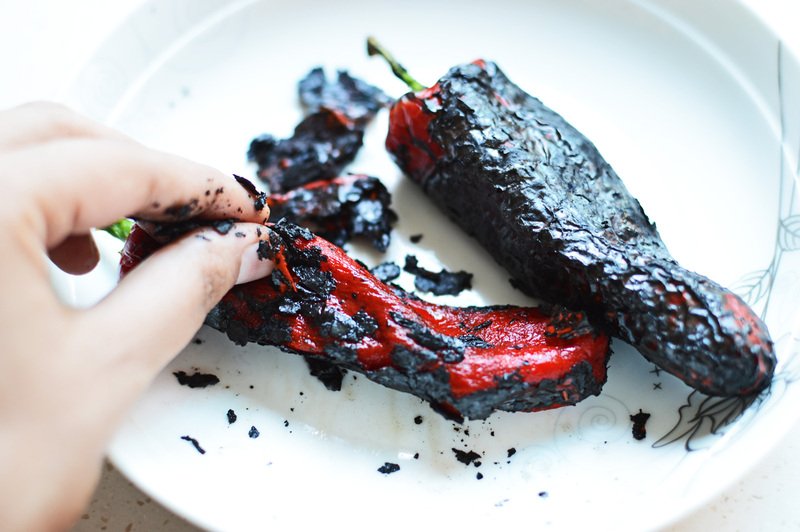 This step makes it easier to take the skins off, and makes these peppers juicy. Let them be in the ziplock for at least 15 minutes, and you can get on with your life till then. See!! I wasn’t kidding about roasting them to a nice shade of Hellish black. These peppers have had their 15 minutes in the ziplock, and it’s time to reveal the divinely delicious peppers that have metamorphosed into food poetry. You need to get your hands dirty, and you won’t even complain. Just peel the skins and they will come off real easy. 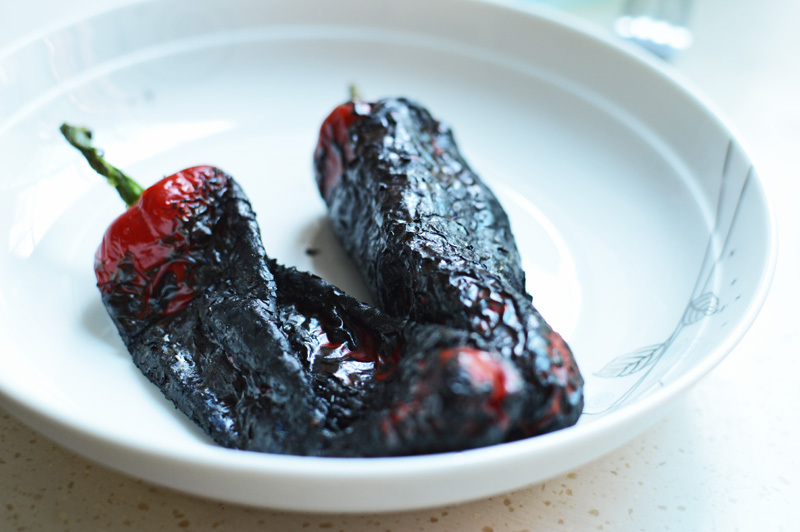 I do not like to be too fastidious with the skinning process, since a bit of charred remain is desirable, as it’s the bits of charred skin that gives these peppers their characteristic smoky flavour. This is what I as talking about. Lipstick red but tastier, aromatic, jewel bright and oh so delicious. Just de-seed them before serving, also a few seeds don’t hurt nobody..
-tear into shreds, drizzle some olive oil, crumble some feta and eat. – puree along with some sour cream, salt and garlic and make a delightful pasta sauce. – add it to your hummus, and make an electric red coloured bowl of greed. Once you’ve made these at home, you wouldn’t want to buy an expensive jar of roasted peppers. It’s an easy process and it’s so much better when you do it yourself. 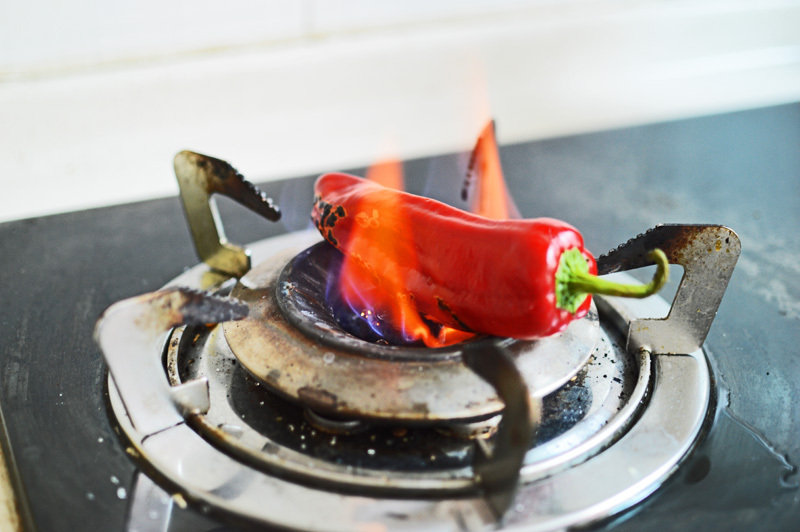 Recipe: On a medium high flame of your stove top place the peppers and keep turning them every 30-40 seconds until they are all evenly charred. Make sure to roast the tip as well. Once you’re satisfied with the colour, place in a ziplock bag and seal it. Let these peppers sit for 10-15 minutes. Finally just peel off the charred skin, making sure some skin remains to ensure a smoky flavour. 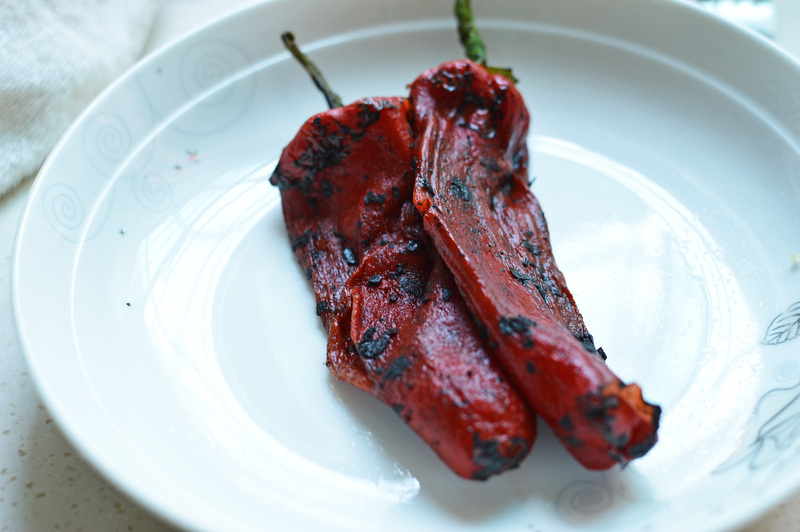 Posted on July 17, 2013 July 31, 2013 by driedredchilliesPosted in DIY, Food cooking & baking, Healthy & Nutritious, Low calorie & comforting, Snack & appetizersTagged red peppers, roast, technique. my mom used to make these all the time! they make an incredibly delicious salad if you add vinegar and oil – but I gotta try the feta & the pasta ideas as well! Hi Kittenhood. Now, I’ve gotta try this in a salad with vinegar and oil! Do share how you liked it with pasta and feta..